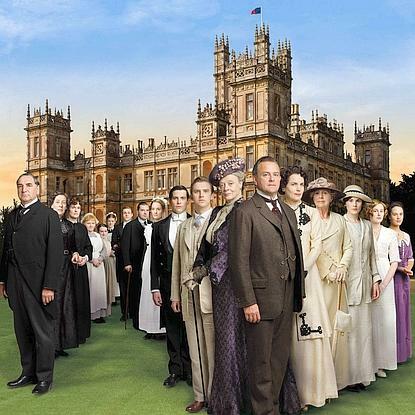 One of the reasons that Downton Abbey is such watchable television is that it focuses on the stories of all the residents of the Edwardian house – whether it’s the well-to-do Crawley family or the working class servants and maids that keep the house running. However, the time period that these characters inhabit means that there are some stringent rules that govern everyone’s behavior and interactions with one another, whether they live upstairs or downstairs. There are definite rules to follow, pitfalls to avoid, and titles that command more attention than others. There are five grades of the Peerage: Duke, Marquess, Earl, Viscount and Baron. These titles can ONLY be inherited – generally by an eldest son – or bestowed by the state. You cannot buy any of them. A Duke outranks everyone except a member of the Royal Family. There is something called a Life Peerage, which can be bestowed in one of the five grades listed above. These have been issued since 1958 and cannot be passed down. As the title implies, the peerage dies with its owner. Baronets and Knighthoods are not members of the Peerage and rank below all five “grades". However, they do get the right to be addressed with the prefix “Sir” in front of their given name (never with only the surname though!). A baronetcy is hereditary only, and cannot be bought. Knighthoods also cannot be bought, but they are only awarded by the state and cannot be passed down. Neither baronetcies nor knighthoods can get you a seat in the House of Lords though. But what if I want to get myself a British title? You can actually buy yourself a Scottish Feudal Barony or a Lord of the Manor title. Though as always, you should be careful about how much money you’re willing to spend for something random on the internet. And what is the peerage, anyway? The Peerage is the collective body of noble titles in the UK, though the term can also be used to refer to a specific title (i.e. “The monarch has bestowed a peerage on him”). A peer of the realm is someone who holds one (or more, maybe) of five possible titles of nobility bestowed directly upon him or his direct ancestor by the Monarch. In modern practice, no new hereditary peerages are created, except for members of the Royal Family. Only new life peerages are created (which generally do carry the right to sit and vote in the House of Lords). If an individual hereditary peerage has no male heirs, that peerage (the individual Dukedom/Earldom/etc) would become extinct. So, how does this work on Downton Abbey? In our story, the Earl of Grantham is a peer and the present head of his family and the Downton estate. He’s got a wife, three daughters, a mother, and various other secondary relations who are mentioned. So, let's try a run through of our major players. Robert, the Earl of Grantham. Robert would generally be addressed as “Lord Grantham.” Servants address him as “my lord” and refer to him as “his lordship.” And no one would ever call him “Lord Robert,” as occasionally pressed for time Americans might be wont to do. (Cough cough.) He would sign his letters either “Grantham” (if writing to friends) or “Robert Grantham” (if not). The family surname is Crawley, but this is not used by either the earl or his wife. Cora, the Countess of Grantham. As the earl's wife, Cora would generally be addressed as “Lady Grantham” and forms of address specific to her would mirror those of her husband, but in a feminine form. Thus it would be, “my lady,” “her ladyship,” “Cora Grantham” in correspondence, etc. Never would she be referred to as “Lady Cora” either. Sidebar: I can’t imagine what kind of work it must of taken for her to learn all these rules of address and etiquette, coming into the family as an American. Whew. Violet, the Dowager Countess of Grantham. Violet is Robert’s widowed mother. Technically, she is still “Lady Grantham,” the same as the current countess, but for ease of reference would probably be called “The Dowager Lady Grantham,” or just “The Dowager” to set the two of them apart. She would be referred to as “The Dowager Countess” in more formal situations. However, her daughter-in-law appears to refer to her as “Lady Grantham.” The servants call her “my lady” and “her ladyship,” also occasionally “The Dowager Countess”. Mr. Matthew Crawley. Matthew is the earl’s third cousin, once removed, and heir presumptive to the earldom. He is descended from a previous earl, but is not a peer himself; therefore, up to and until the point which he actually inherits Downton, he remains simply “Mr. Crawley.” Most of the earl’s family calls him “Cousin Matthew” and the servants address him as “sir”. I imagine if he were the heir apparent - instead of presumed - there would be some changes to these rules of address, but since technically he could still be displaced should the earl and his wife have a son, nothing needs to be altered for him as yet. Whew. And that’s only how we talk to – and about – the major players at Downton, which barely scratches the surface of the seemingly endless intricate etiquette rules of the time period. For example – dinner is also another potential social minefield, as guests are supposed to be seated according to rank. It’s no wonder that any Americans getting OBEs or knighthoods or somesuch from the Crown get invited to a rehearsal first.